With frigid temperatures pushing through our region, the demand for heating repair has been very high. There have been several reports of fake service technicians working hard to rip-off homeowners rather than help them restore the heat. We want to make you aware of these scams and give you some tips to help you avoid imposters and avoid getting taken advantage of when dealing with a furnace problem. When someone comes to your door, always ask to see an ID badge. Most companies also have logo'd apparel and vehicles. If the HVAC service provider can’t offer proper verification of identification/company employment, DO NOT let them in your home. It’ that simple. It’s okay to take it a step further and ask to see a copy of the company’s license and insurance certificate. Most heating and air conditioning employees carry copies of these documents, and as the homeowner it’s your right to request you see them before any work begins. Be careful of where you look for help. It’s always good to do a little research on a heating and cooling installer before hiring them to help you. Get referrals from your friends, family and neighbors. Research the company by finding their profiles online and by reading their Google, Facebook, Angie’s List, etc. reviews. 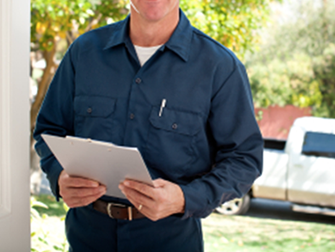 Ask the HVAC service provider of your choice to provide a list of referrals. Doing 20-30 minutes of research could save you a lot of time, money and hassle in the long run. If you cannot find any positive background information or comments about a heating and cooling company, you may want to think twice before giving work to someone that can’t provide details about their previous work history. Do not give cash to any service technician or installer BEFORE the work is completed. If you are purchasing a new heating or air conditioning system, you may have to apply for a new line of credit, but you should not owe any money until the day of the installation. Beware of people looking to perform professional heating and cooling work as side jobs. It takes a lot of training to stay proficient in an industry such as HVAC. Most people working on the side may claim their labor rates are cheaper, but there’s a good reason for that. These individuals simply do not take the time or have the resources to stay up-to-date on the latest building codes and manufacturer specifications. Also know that most HVAC employers do not let their employees take on side work because they don’t want to be responsible for second-hand installation problems or repairs that are not compliant with manufacturer warranties or do not meet industry codes. In summary, if it seems too good to be true, it probably is. Stay safe from scams this season, and should you have any questions about a company you are considering always know that it’s okay to check with your local BBB about the current status of the contractor. By following these tips you’ll be able to enjoy a very warm and safe winter season.